In another time, and another place, a group of heroes much like the ones we know face the greatest challenge of their lives. An intergalactic being called Zordon, assisted by Alpha 5, bases himself on Earth to guard it against evil forces, such as Rita Repulsa and Lord Zedd. 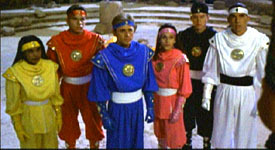 He recruits teens from the city of Angel Grove to protect the planet as the Power Rangers. To save a space observatory from closing down, the Rangers compete in a Jump-a-Thon, where they show off their skydiving skills. Shortly after, an ancient evil being known as Ivan Ooze is released from imprisonment by Lord Zedd. Ivan unleashes his Ooze Men on the Rangers as he infiltrates the Command Center and decimates it, crippling Zordon, znd destroying the Ranger powers. The Rangers fight valiantly, and defeat the Ooze Men, tracking them down with the Power Beam and the Power Scope, and fighting them with weapons such as the Pterodactyl Thunder Whip, Stega Stinger, and Saba. But in the end, they lose their powers. Ivan double crosses Zedd and Rita, capturing them, and taking Goldar and Mordant as his own help. He then enslaves the parents of Angel Grove and has them dig up and build his Ectomorphicon Titans - Hornitor and Scorpitron. 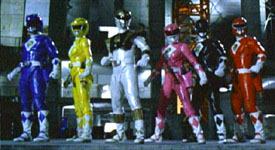 To get their powers back and save Zordon, the Rangers take a dangerous trip to the planet Phaedos, where they are given powers as Ninja Rangers by Dulcea. They battle Tengu warriors, a living Dinosaur Skeleton, and stone Gargoyles to reach the Great Power, which restores their full Ranger powers, and grants them new Ninja Zords. Back on Earth, the enslaved parents are sent to their deaths by Ivan. They are saved by the quick thinking of local youngster Fred Kelman, with the help of Bulk and Skull. The Rangers return to Earth and defeat the Titans with their new Zords. When Ivan himself morphs into a Titan, the Rangers form the Ninja Megazord, which combines with the Falconzord to form the Ninja Mega Falconzord, and lure Ivan into space, where is destroyed by a comet. The Rangers rush to the Command Center and save a dying Zordon with the Great Power.